ATAD3A MaxPab polyclonal antibody. 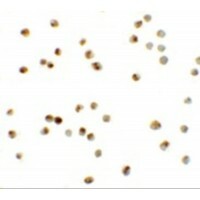 Western Blot analysis of ATAD3A expression in human spleen. Western Blot analysis of ATAD3A expression in transfected 293T cell line (H00055210-T01) by ATAD3A MaxPab polyclonal antibody.Lane 1: ATAD3A transfected lysate(64.46 KDa).Lane 2: Non-transfected lysate. ATAD3A MaxPab polyclonal antibody. Western Blot analysis of ATAD3A expression in HeLa. Western blot analysis of ATAD3A in Daudi cell lysate with ATAD3A antibody at 1 ug/mL . 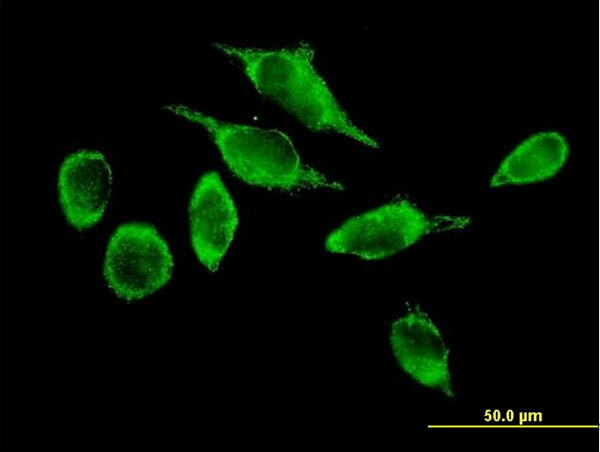 Immunofluorescence of ATAD3A in Daudi cells with ATAD3A antibody at 20 ug/mL. Immunocytochemistry of ATAD3A in Daudi cells with ATAD3A antibody at 20 ug/mL. ATAD3A Antibody (N-term) (Cat. 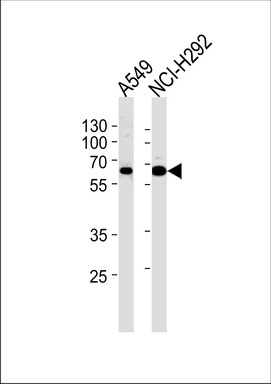 #TA328140) western blot analysis in A549Ã¯NCI-H292 cell line lysates (35ug/lane).This demonstrates the ATAD3A antibody detected the ATAD3A protein (arrow).